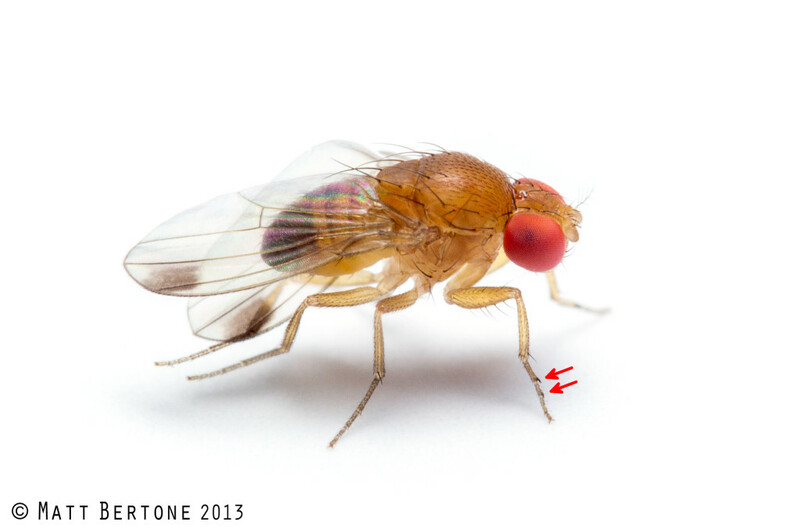 Spotted wing drosophila (SWD), Drosophila suzukii (Matsumura), is an exotic pest of Asian origin. First detected in California in 2008, it has currently been detected in at least 41 states in the United States, and into Canada, Mexico, and many European countries. Adult flies are smaller than 4mm, colored light brown with red eyes. Male SWD have a dark spot on the leading edge of the wing, unbroken bands across the top of the abdomen, and two dark combs on each front leg pointing toward the tip of the leg. The wing spots are an easy to spot characteristic; however, these marking are not always present on newly emerged males. Females lack wing spots but have unbroken bands across the top of the abdomen. Females can be distinguished from native Drosophila by their large, saw-like ovipositor (egg-laying device) which has two rows of teeth that are much darker than the rest of the ovipositor. Eggs are laid just under the skin of fruit through an oviposition hole made by the female. The small, oblong white eggs require magnification to see, but can be distinguished by two small breathing tubes that look like white threads. The breathing tubes are usually visible extending out of the oviposition scar. Larvae, or maggots, are small (2-3mm), and multiple larvae can be found feeding inside a single fruit. When mature, the larvae pupate either partially or fully outside of the fruit. Drosophila larvae cannot easily be distinguished to species visually, but no other Drosophila species has been documented feeding on sound-appearing blueberries, blackberries, raspberries, or strawberries in the southeast. SWD pupae are brown and have a pair of distinct breathing horns on the rear end. SWD may pupate inside, on, or near fruit, or they may exit fruit and pupate in soil. Left: Unidentified Drosophila larvae on banana peel. Image © Matt Bertone 2013. Right: SWD pupae. Image Jesse Hardin. Studies from Japan have observed up to 13 generations per year (Kanzawa 1939). The shortest generation times observed have been 8 days and 2 hours at ideal temperatures (25ºC or 77ºF) (Lee et al., 2011). Typical development time from oviposition to adult emergence is likely closer to 10-14 days. Adults have been shown to survive up to 88 days at 10ºC (50ºF), but their lifespan decreases with temperature resulting in 100% mortality at 1ºC (Dalton et al., 2011). 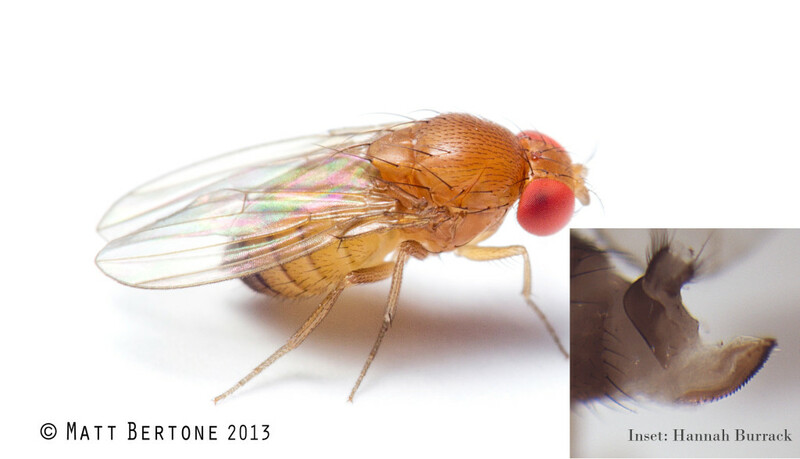 Spotted wing drosophila are significant pests of soft-skinned fruit crops because females are able to lay eggs in undamaged fruit, unlike other Drosophila flies. Larvae feed inside ripe or ripening fruit, causing softness and opening the skin with holes. The presence of larvae makes the fruit unsuitable for market. The near global establishment of SWD in fruit growing areas has significantly impacted yields and production practices. Spotted wing drosophila has been found in the U.S. on cherries, grapes, blueberries, raspberries, blackberries, and strawberries. SWD may feed on damaged peaches, plums, apples, pears, nectarines and other thin-skinned fruit are potential hosts, but do not appear to attack these fruit if they are undamaged.